Anyway how is soEmo.co.uk progressing in terms of numbers...? I can't believe Halloween has gone by and people are talking about Christmas already. Where has this year gone! Many more changes are to come as ever and we are open to suggestions for ways to improve the site. Anyway how is soEmo.co.uk doing in terms of numbers...? The emo meet seems like a distant memory now, but lots is still going on with the site and we'll have another meet in the future! Lots more changes are to come including mulitple deletion of items, e.g. private messages. Anyway how is soEmo.co.uk progressing...? Hopefully it will be the first of many group meets and as I have mentioned elsewhere a lot has been learnt from this experience to improve on the next. 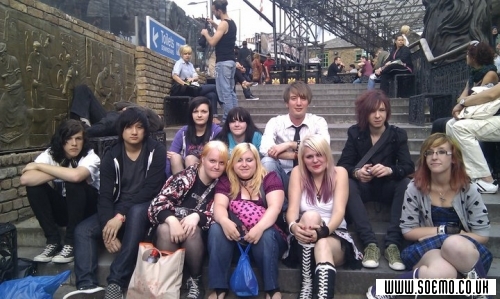 A couple of group pics are below, but you can check out all the pics taken in the Emo Meet forum topic. If you didn't already know we have a T-Shirt Design Contest. Please submit your entries by the end of August. This is a fantastic opportunity and I know there are lots of talented artists on here! Anyway how is soEmo.co.uk doing 4 years on...? Discuss this news item in the following forum topic: soEmo.co.uk - 4 Years Old OMG! Please remember we are still hoping to have the Emo Meet in London, UK this August! Please express your interest in the forums. Can't wait! As ever a quick update on how the site is doing... The new improved emo chat facility certainly has been a success judging by the substantial increase in visitors. We already have a few moderators (xXeMoRaCeRXx, MikeD_UK, Nick_Otmazgin, JojoCupcakeKillerrxD) on the chat to keep things in check and don't require anymore...yet! Improvements to the emo forum including the ability to view new posts/topics since your last visit. More effort into promotion on Facebook. Please email info@soemo.co.uk if you'd like to help out. Also the uk emo meet is still hopefully going to happen and Saturday August 6th is the proposed date. Please see www.soemo.co.uk/forums/topic.php?id=2803448 for details and to express your interest. Multiple chat rooms (currently The Hangout and Help & Advice) but more will likely be added in the future. Please suggest what rooms you'd like. Moderation facilities (kick, ban, etc). Please email info@soemo.co.uk if you are interested in becoming a chat moderator. As before the chat rooms are only for registered members. It's certainly more popular than the old chat system already so make sure you check it out!! Don't forget about the rest of the site though :] The chat is just a small part of the overall site. You can browse the rest of the site and return to the chat easily (or have the chat in one browser tab and another tab for the rest of the site as I do). and got the site back up on a dedicated server with GoDaddy. As I have mentioned before it costs more, but I wouldn't let you all down would I! :] Everything is currently running smoothly now we are settled in on the new server. Also as ever more work has been put into promoting the site online. The main things to sort next are increasing exposure in the USA and continue to sort an improved emo chat facility! Also as ever more 'backend' coding and database improvements have been happening and a full re-structure is in process. Some of the items next on the To Do list include multiple picture uploads, improved emo chat facility and some competitions! On behalf of www.soEmo.co.uk, may I wish you all a Merry Christmas and Happy New Year. We're still going strong and lots of exciting developments are planned for 2011. It's hard to imagine another year has flown by. Please discuss your Christmas and New Year Eve celebrations with everyone in the forum. I can't believe it's been 3 months since the last news update. Also as ever a fair amount of 'backend' coding and database improvements have been happening and there are lots more still to do! Some of the items at the top of the To Do list include improved profile navigation, the ability to block other members, improved chat facility. A few users have requested private profiles, which will be looked into as well. You wouldn't believe it, but time has flown by and soEmo.co.uk is now 3 years old. As ever there are a wealth of improvements to be made and more effort is going to be put into marketing the site. This will start with a new Google AdWords campaign. How is soEmo.co.uk doing 3 years on...? Discuss this news item in the following forum topic: soEmo.co.uk - 3 Years Old! A fair amount of 'backend' coding and database improvements have been happening and there is a lot more to be done to make everything more efficient. I'm sure some of you will know I'm fussy...! In addition improvements you'll actually to able to use are on the To Do list such as blocking users. Please remember don't give out your email address to anyone you don't trust. Please remember we also can be found on Myspace (www.myspace.com/xx_soemo_xx). The emo chat facility is slowly picking up. Thanks to all the members who have already participated. This area of the site will be promoted more soon. Numerous improvements have been implemented on the site such as the long-awaited enhanced notification system and lots of coding tweaks behind the scenes. As ever there are still many further improvements in the pipeline. As well as the popular emo forums we now have an emo chat facility. It is relatively basic with just the one chat room at present, but hopefully it'll become popular and develop in the future. The chat is only available to registered users and you will remain logged in until you logout/leave the site. As Christmas approaches, we'd like to thank you all for your ongoing participation throughout 2009. On behalf of www.soEmo.co.uk, may I wish you a Merry Christmas and a Happy New Year. The Christmas break will give me some time to work on the site and tick off a few more important improvements and updates. Hopefully www.soEmo.co.uk will continue to prosper throughout 2010.
soEmo.co.uk would like to wish everyone a Happy Halloween. Hopefully some of you are dressing up and will have a spooky night to remember. Post your comments on the Halloween forum topic. These stats indicate a healthy increase since the last update back in July. Furthermore soEmo.co.uk is performing well in the eyes of Google with a large amount of pages indexed, many backlinks and a PageRank of 3. We have also recently started a Google Adwords campaign. Recent site improvements include status updates, a sitemap, profile vids and numerous coding improvements. You wouldn't believe it, but time has flown by and soEmo.co.uk is now 2 years old. An awful lot has changed in the last year including a complete newly designed and programmed site, which has been complimented by many. This time last year we only had about 650 members, but now the emo scene community is home to over 2500 members (a 385% increase). The emo forums hadn't been live long this time last year, but they are now buzzing with in excess of 22300 posts. soEmo.co.uk would particular like to thank the users who have continually posted insightful emo poems in the relevant forums section. Now the site has a substantial user base it is great to see members really interacting with and helping out one another. As expected, the emo pictures has been a great addition to the site with over 2500 emo scene girls and almost 800 emo guys pics. As ever soEmo.co.uk would like to make you aware that the site is in constant development and further improvements include enhanced notifications, profile videos, the ability to block people, etc.. Finally the site has held a top 3 ranking for emo fashion on Google for a while now. If you are one of the many great alternative/emo fashion clothing companies please get in touch regarding marketing. 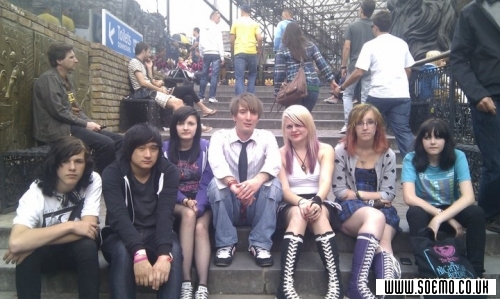 At last the new soEmo.co.uk Emo Scene Community is live. You will notice the look has completely changed. The red and black belt is actually mine and that is how the idea started. The previous site was starting to look a little bland, dated and wasn't ideal for the search engines. As well as the design and layout the coding has also been vastly improved and extra features added like the emo pictures section. There are many other improvements throughout the site that hopefully will make it more enjoyable and easier to use. www.soEmo.co.uk is still progressing steadily and we now have in excess of 2300 members and almost 22000 forum posts. Hopefully the new site along with more effort put into marketing will result in further growth. Even through the new site is complete future improvements include an improved notification system and much more. Like with any major site changes there might be some initial issues to solve. If you have any problems or feedback on the site please email info@soemo.co.uk or post in the Site Feedback, help and suggestions forum section.